Christian parents are not exempt from the struggle and heartbreak caused by rebellious children. This softcover version of the classic resource The Hurting Parent by Margie Lewis, written with her son, bestselling author Gregg Lewis, for the first time offers the rest of the story that inspired the original edition of this book. The Hurting Parent takes a realistic approach to the problems young people face today---peer pressure, easy access to drugs and alcohol, and cultural influences that pull them from their family's faith. The Lewises acknowledge there are no simple formulas or simple answers. But the biblical insight, emotional understanding, and practical encouragement they offer will be life changing. 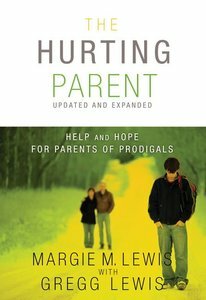 Written by a hurting parent for other hurting parents, this book, by ministering to hundreds of thousands of families over the past thirty years, has earned a prominent spot not only on the personal bookshelves of countless parents and their family and friends, but also on the professional shelves of pastors, youth ministers, and Christian counselors.